I'm the kind of person who tends to seek out the best build for whatever class I am playing in a season, and I will stick with it until I feel like I can no longer push any higher in greater rifts. The feeling I get out of optimizing and tweaking a build until there is no more performance to squeeze out of it is just one of many reasons I continue to play Diablo on a regular basis. I'm always looking at how I can possibly improve my gear, skills, or play-style; however, if you are anything like me, you know that you need a break from the cutting edge every once in a while... Sometimes, you just need to laugh maniacally at your screen and have some fun. One of my favorite things to do in Diablo is to come up with dumb builds. These are builds that put a massive grin on my face, but they don't need to be very good or serve any specific purpose. They are often centered around one or two ideas, and their only requirement is that they make me have a hysterical amount of fun. Not every build in the game needs to be able to clear greater rift 120+ solo with time to spare. There is plenty of room in the game for builds that are simply fun to play, and put a smile on your face. Today's build spotlight for the Mad King's Laboratory is a build I made with only one goal for my Necromancer: I wanted to go fast! I was tired of being left behind in rifts, so I needed to shed my old identity as the brooding corpse-raising-pale-skinned man who didn't socialize well in Tristram because of the horrible smell of undeath around me. I needed to become someone else, I needed to become something else.... I needed to become the Flash. Big things sometimes have small beginnings, and this build began with the Steuart's Greaves---a pair of Necromancer boots that increases your movement speed by 100% after using Blood Rush. I incorporated the boots in my Necromancer Torment XIII speed farming build that I call the Corpse Party. While using these boots, I was suddenly much quicker in rifts at the expense of a little extra damage; although, I realized it wasn't enough... I wanted to be even faster. I shifted my entire focus on not necessarily being good, but being fast. As it turns out, it's possible to do both. This build is quite impressive for clearing Torment XIII rifts quickly, finishing bounties, or even power leveling a friend. Your toughness is reliant on picking up gold to boost your armor with Goldwrap, but if you want to do low level greater rifts you can easily switch it out for Dayntee's Binding. All of your damage is coming from Bone Armor and Corpse Explosion. Keep an eye on your Golem, since he will be dropping a corpse every second for to you explode with the use of the Moribund Gauntlets. If you ever find yourself needing a corpse immediately and your Golem is too busy trying to kill a lone enemy in the corner of your screen, just use your Blood Rush to drop a usable corpse at your feet! This is fairly easy to gear for, but there may be a working variation of this build that uses the Legacy of Nightmares ring set and ancient pieces of the gold gear---such as Goldskin and Kymbo's Gold. In fact, you should feel free to adjust anything you see in this build in order to fit your needs. You can easily drop some speed in favor of more damage, or vice-versa! But just remember, the entire goal of this build is not to be good, but to be fast! Let me know in the comments what changes you would make to the build, or you can share your own crazy build with me for future spotlights with the Mad King's Laboratory! The hotfix went live just after 6 p.m. PST on Friday, 11/17 and the Legendary ability on Shield of Fury was re-enabled at that time. If you notice further issues, please post in the Bug Report forum. Thanks! It's come to our attention that the Legendary power of Shield of Fury is unintentionally affecting other Crusaders' Heavens Fury instead of only your own. We are immediately disabling this power across all regions while we work on a hotfix to resolve this issue. We anticipate releasing this hotfix as soon as possible (after thorough testing is completed) and, in the meantime, believe that it is too early in the season for this to have a lasting impact on the leaderboards. Once the hotfix has been applied, we will be re-enabling the power. We'll update this thread once we can confirm the hotfix and the power are both live. Thanks for your patience and understanding while we work to resolve this issue. In October, we announced that we’ll be converting from USD to local currency on Blizzard Battle.net® in Canada, Japan, and New Zealand. These changes will begin to roll out in these regions within the next 24 hours. For players in these regions, Blizzard Balance will be unavailable during the brief update process, but purchases can be made using other payment methods. Any purchases made during this period will be processed in local currency. For World of Warcraft® subscribers, the recurring subscription will continue to be charged in USD for the next 12 months. If there’s any interruption to your subscription, however—including an expired card, changes in payment methods, or account cancellations—any new subscriptions will be charged in your local currency. We want to make as many of our players as possible feel at home in the Blizzard ecosystem, and make managing your account with us easier. By switching from USD to local currency, we’re expanding the types of payment we accept and helping some of you avoid paying transaction fees charged by financial institutions. Please see our announcement in October for more information and follow @BlizzardCS for the latest updates. OSW_Zenkiki published the article Patch 2.6.1 Roundup and Season 12! Level with a cause is a charity event that will run from November 9th to November 12th. During this event you will find your favorite Diablo streamers raising money during the start of Season 12 for Take This, a non-profit charity that is raising awareness of mental health issues within the gaming community! You can see a full list of the streamers and help support this amazing charity here! Or, you can keep an eye out for #LevelWithACause in stream titles on Twitch! Patch 2.6.1 is out, and Season 12 is about to begin! With the new patch comes countless item and balance changes, and all of the changes help to establish a far more balanced competitive meta between individual builds! You will find far more viable build options available to you this season, regardless of what class you are playing! Thanks to ComradeKoch for compiling the patch changes! Season 12 begins Thursday, November 9th at 5:00 p.m. PST in North America, 5:00 p.m. CET in Europe, and 5:00 p.m. KST in Asia. Posted in: Patch 2.6.1 Roundup and Season 12! OSW_Zenkiki published the article Double Treasure Goblin Event Is Live! Double Treasure Goblin Event Is Live! The double treasure goblin event has gone live, and will end on Thursday, November 9 at 5:00pm PST! The event will end when the new season begins; however, it should provide some extra fun in Diablo until the start of season 12! You can view the full blog post below. Patch 2.6.1 is now live worldwide, and Season 12 is just around the corner. We want to help you stretch your muscles and get prepared for the latest patch with a special in-game event—double Treasure Goblin spawns! Each time you encounter a single Treasure Goblin, they’ll be hanging out with a buddy whose bags are overflowing with all your favorite treats and treasures. This Double Goblin event will begin in the Americas region on November 6 at 5:00 p.m. PST, and ends on Thursday, November 9 at 5:00 p.m. PST. Note: This buff does not affect the number of goblins encountered via a Bandit Shrine, Goblin “Rift” packs, or in the Realm of Greed. We hope you’re excited for all the balance changes crammed into Patch 2.6.1, and we look forward to hearing about your upcoming Season 12 adventures. In the meantime, good luck, have fun, and we’ll see you in Sanctuary! Posted in: Double Treasure Goblin Event Is Live! In this panel Brandy Camel (the Diablo Community Manager) interviewed several content creators for Diablo that you are likely familiar with: Rhykker, Leviathan, BigDaddyDen, and Lynxaria. A lot of the questions were fun and entertaining, but an interesting question was asked at the end that will likely satiate some of our conspiracies about a potential new Diablo game. For the last question, Brandy asked the following to the panel: "As you guys know, those of us working on Diablo at Blizzard, we're exploring what's next... While we don't have anything to discuss today, or this weekend, I want to know what your thoughts are. What are you speculating?" She then turned to the crowd and emphasized "Again, speculation! Let's be clear about that!" While we certainly have our own speculations about what the next game could be, this at least seems to indicate that there is indeed something being worked on. With that in mind, I pose the same question. What do you speculate the Diablo team is working on? Let us know in the comments! You can find bullet points of the entire panel below. What was your first diablo game? Leviathan: Diablo 2, right before LoD released. What is it about Diablo that makes you want to create content? BigDaddyDen: Fun factor, and the Diablo community as a whole. Leviathan: Educating players with new builds or ideas. Rhykker: Already doing research on the game, why not share it by making content? What is a good Diablo memory that you want to share? BigDaddyDen: First ever Starmetal Kukri drop. Leviathan: Getting Rank 1 on the Cursed Chest conquest in Season 3. Lynxaria: Completing a greater rift when it's the worst layout/monsters/guardian. Rhykker: Playing Demon Hunters with his cousin when Reaper of Souls launched. Brandy: Doing panels like these. Hearing these stories and moments is what community management is all about, and it is very fulfilling. Rhykker: Wizard in vanilla, but Demon Hunter in Reaper of Souls. Brandy: Most hours played on Barbarian, and the name Dayntee comes from her tabletop RPG barbarian. If you were a treasure goblin, what type would you be? Leviathan: Blood Thief, because they must have some kind of shady deal with Kadala... Where else are they getting all those blood shards? BigDaddyDen: Want to see new goblin that is fat, when you hit them they bounce around the screen and drop bounty materials. Rhykker: Gem Hoarder... Because Rhykker is apparently a notorious hoarder. Brandy: Can't pick a goblin, because she resonates with Kadala the most. If you could create a legendary, what would it do? BigDaddyDen: One that has a pet mechanic, such as stacking your Witch Doctor fetishes so they make one large fetish, or one that allows your fetish to jump onto the back of your zombie dog and use it as a mount. It wouldn't effect just the Witch Doctor, but all the classes that have pets. Lynxaria: Flail that turns blessed hammers into hamsters. Rhykker: An item that applies to any class and adds more options. Such as a legendary gem for your weapon. It would need to be strong enough to compete with losing critical hit damage from an Emerald. Maybe give some kind of attack speed and movement speed buffs. What are you speculating is next for Diablo? Rhykker: Frank Pearce pledged his loyalty at BlizzCon last year, and stated that Diablo has a future. That information, combined with the job postings that we've seen, indicates there is no doubt that something is coming. Ready and can't wait for what is next. Leviathan: Likes what Destiny 2 has. Maybe the next game could add MMO mechanics such as 8 person "raids." BigDaddyDen: Some kind of end game raid mode, maybe even a level-field competitive mode that doesn't require farming paragon points. Lynxaria: Easy to speculate, and we each know what we individual want. Envisioning a new project can be a challenge. We all know something is coming, but it's a matter of when and being patient. Can't even imagine what is next, but it's going to be amazing either way. Brandy: Even in moments the development team becomes quiet, it doesn't mean they aren't listening to feedback or what the community is saying. The team has been evolving how they interact with the community over time. They are just people working on their passion project, and are excited about Diablo as much as the community. This BlizzCon panel gave us some insight on how Blizzard created some of the visual effects for the Necromancer in Diablo 3. While we didn't get any important pieces of news, we did learn a little bit about how the Necromancer effects were made! Here are some bullet points covering several topics that were discussed. This ability seemed strait forward at first, but it took a long time to find its spot in the Necromancer kit. Pets have an unspoken cool factor, and if they don't immediately feel awesome then it doesn't matter what the pet actually does. Once the team received really cool art from a character artist, it set the tone for the skill. Because of the nature of a Diablo style game, visual readability can often be a problem. With curses in Diablo 2, it was hard to tell what enemies were going to be effected by your curse when you cast it. This lead to a focus on showing the area your curse would effect when it was implemented into Diablo 3, and also if the enemies were effected or not. The icon that shows if an enemy is cursed was at one point multiple colors based on what curses were active or not, but they pulled back on the color since it started to feel clownish and too happy. Starts between a dialog with the artists and designers as they determine what would best suit the skill. What is the best way to express the fantasy of the skill? What is its usage like? How can Players break the skill with legendary items later? What kind of damage type is it? If a skill is going to have a huge effect on screen, it can't also be one that you are spamming. There weren't many memorable poison skills that the Necromancer had in Diablo 2. The Witch Doctor already had a poison theme. When it came to the death and decay theme of the Necromancer, it took on a dead serious look and tone compared to the silly tone the Witch Doctor has. The team doesn't use a "Waterfall Workflow" like others in the industry. They create a "Feature Team" that includes many people with all different skills, such as different kinds of artists and designers. The team meets often and discusses what needs to be done, rather than handing off responsibilities to separate departments without communicating between each other. Raising Skeletons from dead enemies meant you had to kill enemies before you can have skeletons, which can lead to game play problems. The team wanted to relieve players from the burden of having to raise the skeletons yourselves, but having them all at once made it not seem fun to use as a skill. This lead to the design we currently have. The skeletons summon slowly over time which feels like they are being raised from bodies, but you don't actually need corpses to do it. Playing a Necromancer with other Necromancers lead to a lot of readability issues. This lead to the team developing new tech that allowed some skills to play locally for the player, but not fully to other players. They found time to retrofit all of the other classes with this tech. This tech was added in the Necromancer patch. In order to do it properly, they had to love the class and understand what the players loved about the class. Greetings, fellow adventurers of Sanctuary! My name is Chris, but on the internet, I'm better known as "Zenkiki" (or Zen if you are feeling pithy)! It is an honor and a privilege that I get to introduce myself to everyone as the new Diablo Fans Community Manager! Like many of you, I have been using Diablo Fans as my primary source of Diablo news for countless years. Additionally, it remains my favorite place to find and share builds every season! I am excited for this amazing opportunity, and look forward to helping grow the site into the best place it can be! I'm a passionate gamer at heart, and you can often find me playing a variety of different games. Anything from Shooters to RPG's, or even tabletop games! On the side, I stream and run a successful YouTube channel. Finally, I'm an aspiring game designer who is working on an easy-to-learn cyberpunk tabletop RPG rule set! But none of that would matter if I didn't also bring gifts... So, like a generous grand parent looking to spoil their grand children, I present you with a BlizzCon Virtual Ticket giveaway! Update: The giveaway has ended, and all of the winners have been contacted! Check your inbox! In celebration of Zenkiki joining the team, and BlizzCon being nearly upon us, we are giving away three Virtual Tickets to three lucky community members! With the virtual ticket, not only will you have access to all the usual BlizzCon panels, but you will also receive all of the awesome in-game loot... 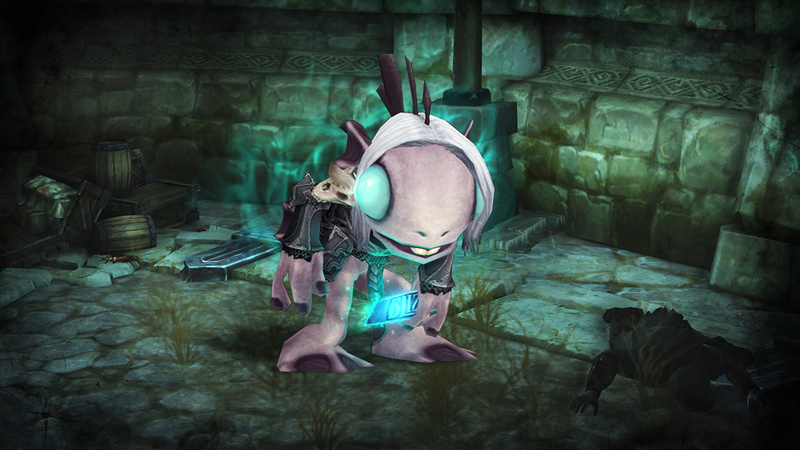 Such as the horribly terrifying yet questionably adorable Murkromancer pet for Diablo 3! Leave a comment on this post welcoming Zenkiki to the site, and include what class you will primarily be playing for Season 12! Follow those easy steps, and you will be entered into a random drawing on Thursday @ 4pm PDT! Any entry after that point will not be counted! Winners will be contacted through private message shortly after the drawing. Time is running out! Hurry and enter into the giveaway before the portal to the Vault closes!